Which, long story short, means that my ISP thinks that trojan emails are escaping from within my prophylactic fortress. seem to line up with a cron job that I run every 9am every morning (Sydney timezones notwithstanding), which sends an email to my own email account on a google server somewhere. So even though I was pretty sure this was a fairly innocuous event, and in lieu of actually getting some useful information from either TPG or AISA as to what these ‘Trojan’ emails contained, I thought I’d better disable my outgoing emails whilst I removed myself from the CBL and looked under the hood. Which is all fine and dandy until I actually want to send an email, in which case I need to log into the thing again, re-enable SMTP, send the email, and then turn it off again. So I wrote a script, which I’m posting up here in case anyone else needs to do something similar. The user could then reopen SMTP trafic by clicking on the ‘SMTP’ rule in the ‘Current state’ section of the page. If you like, try clicking on the ‘Click to view commands sent to router’ or the ‘Click to view iptables rules’ to see the iptables commands, and the previous and current iptables rules that were captured when I cut and pasted these samples into this blog. It runs as a perl CGI script, and telnets into a router and runs some iptables commands to turn on and off outgoing connections to SMTP servers. This will only work if your router has a telnet interface (and it’s enabled); most routers these days seem to have busybox installed on them somewhere, which you should be enable by googling up your router brand/model and the words “telnet” or “shell access”. iptables allows you to define what internet traffic is allowed into and out of your local network. Every packet that enters or leaves a machine goes through it. We’re interested in packets that go through our router, and we’re only interested in the ‘FORWARD’ rule sets, since these govern the internet packets that leave the router. The rules that are displayed are configured using the firewall.json file, which sits in the same directory as the script. for a brief description of the syntax of this file. syntax: this value defines the version of the syntax of the configuration file. This is currently set to ‘firewall.pl-1.0’, but may change if I ever decide to make it a bit more fancy (e.g. adding multiple routers, that sort of thing). Any other keys (e.g. the comment and revision keys at the top of the file) are ignored. Copy it into a directory with executable permissions in your webserver (e.g. cgi-bin), and bob’s your uncle. The getTemplateAsPerl() function converts an ASP/JSP-like script into it’s perl equivalent. It understand <%= ... %>-style substitutions and <% ... %>-style code blocks. See the getFirewallHtmlTemplate() function for the sort of input it handles. 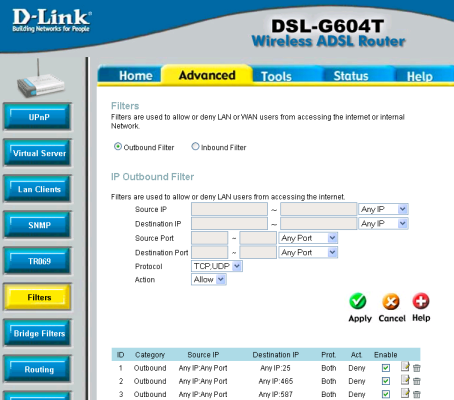 The script currently only performs telnet logins to authenticate to a router (the telnet-busybox connection type); if you add any more connection types (e.g. via ssh, or running on the localhost), let me know and I’ll add them to the script on this site. The username/password credentials for the telnet-busybox connection type are kept in plaintext, but this is probably OK, since the credentials should only work if you’re already inside the ‘trusted’ side of your network, and anyone who has access to the script probably has access to your router anyway. The rules set by this script aren’t persisted or stored anywhere; so when the router running the iptables commands loses and regains power (or is turned off and on again or reset manually), all the rules will revert to their initial state. A rule is considered ‘closed’ if all the iptables records defined for that rule are active, and ‘open’ if none of the iptables records defined for that rule are active. If some (but not all) of the iptables records defined for that rule are active, then the rule is displayed as being partially open: (image of that). Clicking on such a rule will close it completely. Before running this for the first time, you might want to set the DEBUG_ECHO constant defined at the top of the script; this converts any iptables commands sent to the router to echo commands (which just relays them back to you without doing anything). That way you can verify that the commands it sends are what you want, since sending the wrong commands could end up with you preventing all network traffic to and from your router. (If this does happen, just turn the thing off and on again). There’s no locking implemented in this script, so if two people attempt to change the iptables rules at the same time, then strange and unusual things will probably happen. Update 12/5/2013: If you notice a whole bunch of iptables rules of the form ‘ACCEPT tcp/udp anywhere (your IP) dpt:31280‘ (or port numbers near there), then it’s probably Skype trying to tear holes in your firewall. I’m not a huge fan of software being able to circumvent security policy, so if you disable UPnP on your router and restart it, they should disappear.